The frustration and anger in America are growing. 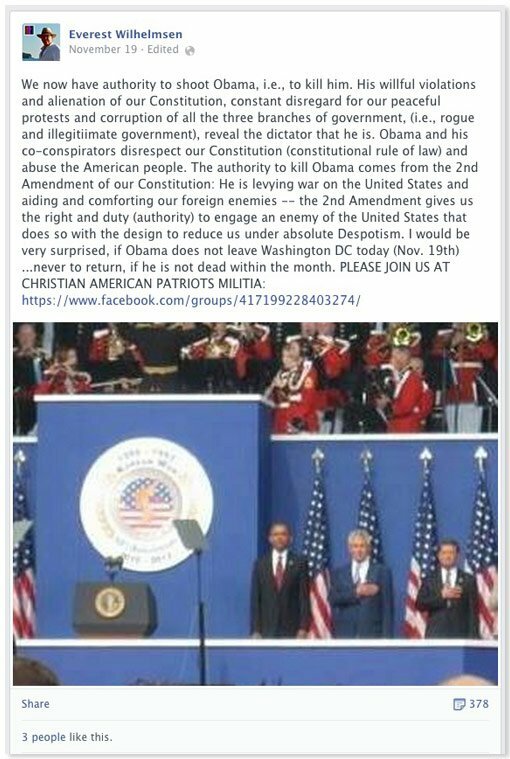 So much so that one militia leader has publicly called for the assassination of the President of the United States. In a post on his Facebook page, Christian American Patriots Militia leader Everest Wilhelmsen has claimed authority under the U.S. Constitution to take matters into his own hands. We now have authority to shoot Obama, i.e., to kill him. His willful violations and alienation of our Constitution, constant disregard for our peaceful protests and corruption of all the three branches of government, (i.e., rogue and illegitimate government), reveal the dictator that he is. Obama and his co-conspirators disrespect our Constitution (constitutional rule of law) and abuse the American people. The authority to kill Obama comes from the 2nd Amendment of our Constitution: He is levying war on the United States and aiding and comforting our foreign enemies — the 2nd Amendment gives us the right and duty (authority) to engage an enemy of the United States that does so with the design to reduce us under absolute Despotism. I would be very surprised, if Obama does not leave Washington DC today (Nov. 19th) … never to return, if he is not dead within the month. The good news is that all those shares you see there are either journalists or concerned citizens reporting Wilhelmsen’s threat to the FBI. And yes, as we’ve seen time and time again, it’s very likely that a sensory deprivation tank figures into his immediate future for talking like this on Facebook. It’s not about freedom of speech, remember. Threats against the lives of others, especially public figures like the president, are taken very seriously and do not constitute protected speech. The Secret Service, of course, was none too pleased about a direct threat to the President and the Facebook post has since been removed. Under Federal law Wilhelmsen can be prosecuted for such threats against political leaders and may face up to ten years in prison. Threatening the President of the United States is a class D felony under United States Code Title 18, Section 871. The offense is punishable by five to ten years in prison, a $250,000 maximum fine, a $100 special assessment, and 3 years of supervised release. Internet restrictions such as a prohibition on access to email have been imposed on offenders who made their threats by computer.